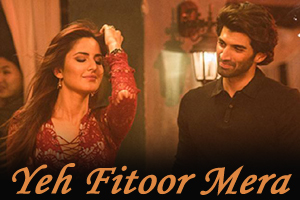 Hindi Lyrics 4 U: Lyrics Of "Yeh Fitoor Mera" From Latest Movie - Fitoor (2016). Lyrics Of "Yeh Fitoor Mera" From Latest Movie - Fitoor (2016). Beautiful romantic song in the voice of Arijit Singh featuring Aditya Roy Kapur, Katrina Kaif. Star Cast: Aditya Roy Kapur, Katrina Kaif, Tabu, Aditi Rao Hydari, Rahul Bhat, Akshay Oberoi, Ajay Devgn, Lara Dutta. The video of this song is available on YouTube at the official channel Zee Music Company. This video is of 2 minutes 37 seconds duration. Lyrics of "Yeh Fitoor Mera"
Lyrics in Hindi (Unicode) of "ये फितूर मेरा"